The Icom ID-51E is a compact handheld radio for 2m and 70cm operating in FM and D-Star with an additional AM/FM wide band Broadcast * receiver. A lot of emphasis was placed on easy use. The display has been increased by 1cm. That way the product has been exposed to be a little larger, but is still perfectly in your hand. The LC Display is easy to read and the simple menu with additional graphical icons shows all information immediately. Of course, the ID-51E is again waterproof to IPX7. The ID-51E has a GPS antenna directly built in. 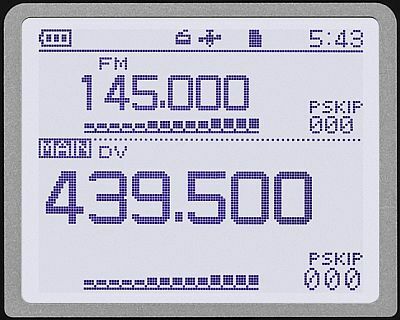 This offers the D-PRS positional informations to the network, letting you see the distance and direction to other stations as well. Further the radio can act as a GPS logger as well, for example to record the track of a mountain hike. If the repeater lists are up to date the ID-51E automatically shows the closest D-Star repeaters. The Icom ID-51E is equipped with a slot for a Micro SD card up to 32GB. In this extra memory, not only all settings and relay lists are saved, but also the data of the integrated GPS logger. The archived data can be read out later to the computer again and are processed appropriately. Similarly, you can save D-Star QSO on your memory card and play them back later. 1304 memory locations, which can be organized in different banks submit make the Icom ID-51E ready for almost all applications. The memories can organized in different banks. It is also possible to store the cut-off frequencies for the scanner and repeater offsets separately. This allows to arrange the memories for example depending on the location. Icom offers a free software for memory management CS-51 (included in delivery). This software is used directly with the Micro-SD memory card or with an optional programming cable. Completely new is the integrated, independent AM/FM wide band Broadcast * receiver. The frequency range for this is from 520 to 1710 kHz (AM) and 88 to 108 MHz (WFM). While you listen relaxed to the radio, you will hear with the dual watch to the local repeater. Once there is activity, the radio reception is muted. It is possible too to listen to two frequencies in one amateur band at the same time. The Dual Watch covers the combinations V/V, U/U and V/U. During the VFO is in digital mode, is the simultaneous monitoring of an analog signal not possible. A memory card is not included in the shipment. Unfortunately WiMo does not offer such cards either. But microSD cards are available at any local electronics or photo store at low prices. You can use cards of any size from 2GB to 32GB, type microSD or microSDHC. The speed requirements for the memory card are not specified.